It is intended to achieve similar acoustic conditions as in an already existing live room. The challenges occurring especially in small spaces are introduced and a number of acoustical absorbers are presented. The types of absorbers capable of damping the low frequency room modes are discussed. 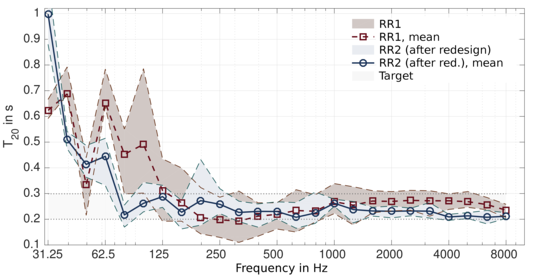 The acoustic measurements are evaluated, the reverberation time is selected as a significant criterion and a low, frequency-independent target value is chosen. A 3D-model for the acoustic simulation software is built and on the basis of the simulations, various optimisation measures are developed. Concerning an adequate dampening of the room modes, edge or corner absorbers are selected as the basic concept for the enhancement and compound panel absorbers are planned to be installed on the walls. For prevention of flutter echoes and a sufficient gain of absorption and diffusion, a panel system on the ceiling is designed. Finally, the acoustical measures taken are presented and evaluated, specifically regarding the reverberation time, room modes and reflections. The figure shows the comparison of the reverberation times T20 of both recording rooms (RR1, RR2) after the acoustic design process (after redesign). The range of all measurement values and the mean value are shown, respectively.